Read the labels of commercial brand toothpaste and mouthwash, and you’ll see plenty of ingredients that you may not like. Worse, many of these ingredients have been clinically proven to cause harm. Although you wouldn’t normally swallow toothpaste or mouthwash, why subject your body to potential health risks? If you’re worried about a moth invasion inside your tube of toothpaste, you might not mind having a pesticide as an ingredient. Otherwise, not so much. Triclosan is added to toothpaste and mouthwash as a purported germ-killer. It’s a pesticide that has been approved for use by the FDA in products like toothpaste and mouthwash. Yet, it’s efficacy for killing germs in humans has never been clinically proven. It has, however, been scientifically proven to be an endocrine disruptor. Young children are especially susceptible. That’s something to think about, right? If you want to ensure only natural ingredients in your toothpaste and mouthwash, try these homemade toothpaste and mouthwash recipes. Ingredients for the following homemade toothpaste and mouthwash recipes are easy to find, and the instructions are simple to follow. First off, this is more like tooth cleaner than toothpaste. You’ll be storing it in a sealed jar, which you can keep on your bathroom sink at room temperature. Put the baking soda in a sealable container. Stir in the tea tree oil with a spoon. Add the filtered water, a little at a time, until a paste is formed. Stir well. This isn’t really a toothpaste recipe, so much as a tooth polishing trick. But it comes from Catherine Zeta Jones, whom I adore, so I’m including it here. According to one interview, Catherine said she polishes her teeth with crushed strawberries. Apparently, the malic acid in the strawberries helps to whiten teeth. I tried it, and by golly, it works! Just crush a strawberry in a little bowl and use your toothbrush to polish. Tastes great, too! Remember that mouthwash should never be swallowed. Just rinse, swoosh and spit out. Even though the following recipes use natural ingredients, you still shouldn’t drink mouthwash. 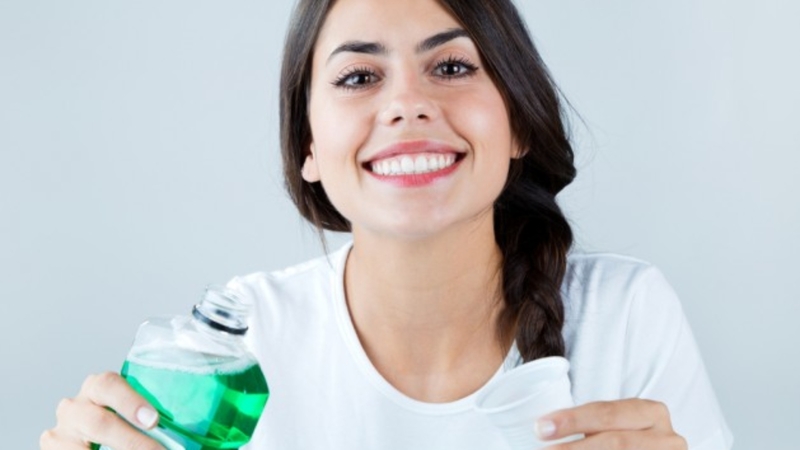 You can store this mouthwash in a Mason jar, re-use an old empty container of mouthwash or even use a used water bottle that’s been cleaned and sterilized. Place herbs in a pint size mason jar. Pour enough boiling water over herbs to just dampen all of them. (this helps release the properties of the herbs). Pour the rum or vodka into the jar with the herbs and hot water. Cover tightly and put in a cool dark place for 2-3 weeks. Each day, shake the jar to help the herbs infuse into the alcohol mixture. After 2-3 weeks, use cheesecloth or a very fine mesh strainer to strain the herbs out of the tincture. Discard the herbs and pour the tincture into small dropper bottles or other glass jar to store. Add the essential oils, return lid and shake well. Homemade mouthwash recipe sourced from WellnessMama.